Last year before I left British shores for Florida, I regularly frequented an absolutely wonderful shop called Lush that was opened back in 1994 by husband and wife team Mark & Mo Constantine under the original name of Cosmetic House Limited, offering handmade bath and beauty products. 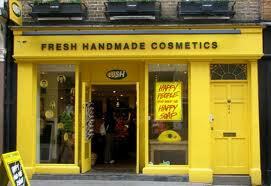 For whatever reason, in 1995 they changed the name of their shop to Lush and proceeded to conquer the UK. One of the things that I like about Lush is that they don’t use animals fats in their products, try to use natural ingredients like fruits, vegetables, honey, beeswax and synthetic ingredients where required, and are passionately against animal testing (they perform tests on human volunteers instead). The main thing that I l❤ve l❤ve l❤ve about Lush is the smell: due to the heavily fragrant content, each of their shops produces a huge amount of amazingly wonderful scent that cheekily escapes the front door and wafts down the road, which means that before you even see the sign you know that there’s a Lush store nearby and, like a smelly Pied Piper, it seductively lures you inside. While living in London, one of my housemates temporarily worked for the Lush store located on Carnaby Street near Oxford and Regent Street in the central shopping area of London, and although she slowly developed nasal immunity to the sweet smells that bombarded her all day, we used to love it when she came home as the distinctive Lush smell would cling to her for hours. Although Lush have a great range of products, I wish that there was a way that they could bottle the scent that their shops produce as, personally, it’s addictive and I find it far superior to any of their admittedly great products when sniffed individually. 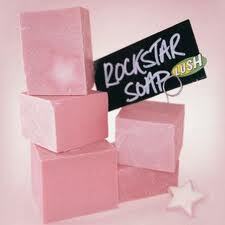 Even though I couldn’t capture the overall magnificent odour of Lush, I found my favourite product scent and got into the habit of buying a big block of their Rock Star soap. This soap cuts as smoothly as cheese, so I would divide it up into small pieces and wrap those pieces in little individual muslin bags, then scatter the bags throughout all my cupboards and shoe drawers so that my belongings would become infused with the sweet, vanilla-candy smell of RS. So when I moved to America I really thought that I would have to forsake many of my home comforts, periodically returning to soggy Britain to stock up on the things that make life bearable (namely chocolate, decent cheese, proper mustard and hugs from my Mum). However, to my delight it would appear that I won’t have to struggle on without every home comfort. Lush opened their first store in historic Poole, a town located on the British South coast, and due to a sterling business model, as well as clever marketing and an addictive, quality product range, they’ve done so well that today they can boast over 678 shops in 45 countries. Go Lush. Which means that if I travel down to Orlando I have the choice of 2 Lush stores from which to buy as much Rock Star soap as the store stocks/the truck can carry. Bogdaggingnabbit, I was down in Orlando only a couple of weekends ago and if, instead of wallowing in a sulk about all the things I can’t obtain in America, I had carried out an internet search for Lush in America, I would have known there were multiple Lush stores over here and could have dragged The Hublet into smelly nirvana.